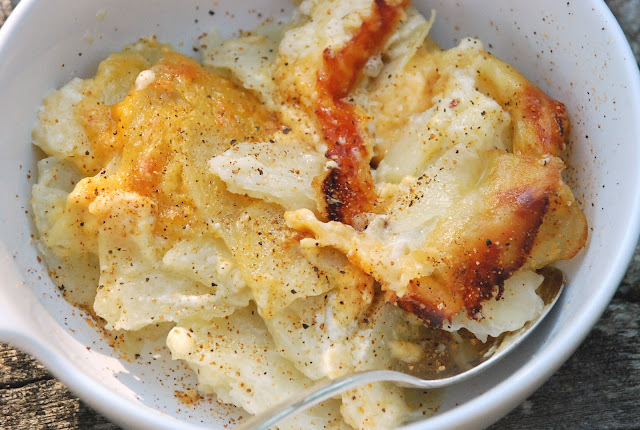 Someone asked me the other day if I had a good recipe for Potatoes Au Gratin. I realized that I did not so I was on a mission to find one. I remembered that Ruth Chris’s version of Au Gratin’s was fantastic In fact, all of their sides are delicious. Again, I used my OXO Chef’s Mandoline Slicer and it was perfect because the potatoes cooked a lot faster instead of cutting chunks as the recipe called for. I used excellent quality cheddar cheese (the most delicious England Apple Wood Smoked Cheddar that I have ever had) and you know not to substitute milk for the cream. Cut the potatoes into 1/4 inch slices, then quarter each of those slices. Beat together the cream, milk, flour, garlic, salt, and pepper by hand just till well combined. Coat the inside of a large baking dish with the softened butter. Arrange the potatoes in the dish and pour the cream mixture over the potatoes. Cover and bake for 20 minutes. Uncover and bake another 20 or so minutes or until the potatoes are starting to brown on the top. Note: Watch the time as every oven is different. The recipe called for a total of 60 minutes but my potatoes were overcooked. The second time around, at 40 minutes total, they were perfect. Sprinkle grated cheese over the top and continue to bake for another 5-10 minutes or until the cheese is melted and slightly browned and the potatoes are tender.